Welcome to Rosey's Memorial Page! Sophia Bayer and Michael Gawdzik asked us to create a page in which guests from their wedding could come and donate in honor of their late Rosey. You will find the yellow donate button under Rosey's Story! We were contacted by a county shelter that took in over 30 dogs in a single day from one location. Rosey was among these dogs. In addition to Rosey, we were fortunate enough to be able to take in another Rottie and four Terrier mixes. All of the dogs were covered in fleas, dirt, and their own feces. Most of them had severe hair loss and other issues. 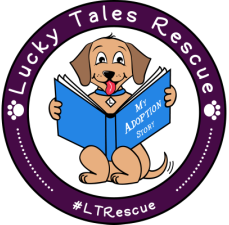 Over time, with TLC, medical attention, and good food, all of the dogs made a full recovery and were enjoying life in their foster homes. Enter Sophie and Michael. They applied to adopt Rosey and we knew this was the family for her and on October 24th, 2015 Rosey became part of their family! Sadly, in mid 2016, we got word from Sophia that Rosey had a brain tumor which caused the spinal fluid to build up in her neck. Eventually, she lost the ability to to swallow and walk. We were heartbroken to hear this news. Sometimes things seem so unfair--she came from such a HORRIBLE place and had finally found her home and was LOVED. Rosey was more than lucky to have found the family she did as they did EVERYTHING they could to save her life. Sadly, despite radiation therapy, the tumor grew too quickly and was not able to be removed., Rosey passed on July 12, 2016. We at Lucky Tales know that Rosey was 100% loved. She got to learn what it was like to live in a home where people treated her with kindness and affection. Even though her time with her family was short, we know that she was happy and that is all we could ask for. We want to thank Sophia and Michael most of all for giving Rosey the best life she could have had. We also thank them for their generosity and support of our rescue. Congratulations on your engagement, we hope you have a WONDERFUL wedding, and we wish you a life of happiness together! In loving memory of Rosey. For my boo, Sophia Bayer. May Rosey's memory always bring a smile to your face. Wishing you and Michael a lifetime of happiness and Rottys.